Kirindi Ella is a waterfall in the southern foothills of Sri Lanka’s central highlands, in only 6.5 km distance from the main junction in Pelmadulla (Palmadulla), where the trunk road A18 to Nonagama at the South Coast branches off from the Colombo-Ratnapura-Batticaloa main road A4. 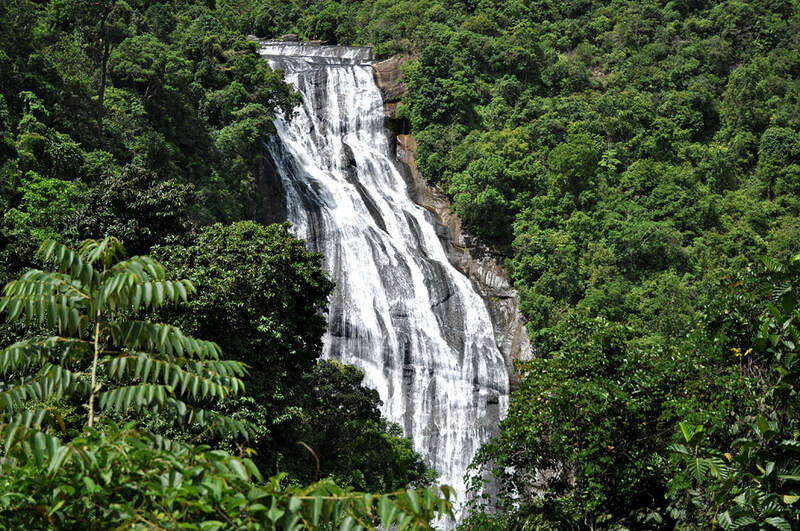 Kirindi Falls in the Ratnapura District of Sabaragamuwa Province are located 19 km east of Ratnapura, 25 km west of Balangoda and 55 km north of Embilipitiya. Kirindi Ella is not a must-see., but worth a detour when you are crossing Pelmadulla. Though mentioned in pocket guides, the waterfalls’ observation platform is usually not at all crowded with toursts. To reach this viewing platform, visitors must walk only a few steps from the ticket counter. It’s also possible to climb further down to the pool below the waterfalls, which will take half an hour up to an hour up and down. The height of Kirindi Falls is 116 metres. The water plunges into a deep pool, which is named Diyagathwala. Folk tales have it that a stone stairway leads to the bottom of the pool, where a treasure trove is hidden, and that human voices can be heard near the waterfall during Halloween and that fireballs can be seen above the fall at night. The top of Kirindi Falls can also be reached, but not from the ticket counter. Rather, the path to the escarpment starts at the Kuttapitiya Tea Factory.